Dear friends, maybe we have heard these two words before 'Carbon Sequestration'...well I did not know what it meant, so I did a little digging and found an article by Larry West in About.com. Mr West wrote that Carbon sequestration is simply the intake and storage of the element carbon. The most common example in nature is during the photosynthesis process of trees and plants, which store carbon as they absorb carbon dioxide (CO2) during growth. Because they soak up the carbon that would otherwise rise up and trap heat in the atmosphere, trees and plants are important players in efforts to stave off global warming. He also stated that environmentalists cite this natural form of carbon sequestration as a key reason to preserve the world’s forests and other undeveloped lands where vegetation is abundant. And forests don’t just absorb and store large quantities of carbon; they also produce large quantities of oxygen as a byproduct, leading people to refer to them as the “lungs of the earth.” On the technological front, engineers are hard at work developing man-made ways to capture the carbon spewing from coal-fired power plants and industrial smokestacks and sequester it by burying it deep within the Earth or the oceans. He goes on to say that essentially the technology involves disposing of carbon dioxide after it is produced, rather than trying to hold down its production in the first place. United Nations’ studies suggest, however, that it might play a bigger role in fighting global warming this century than any other measure. Okie dokie....Don't want global warming to do more damage?.... Better plant trees...and let the trees trap those carbons and put them to good use. Imagine ...OXYGEN...the all important in our life, is the byproduct of this process !!. Release those dangerous heat from our atmosphere !! If you want to view the whole article, please go to About.com. 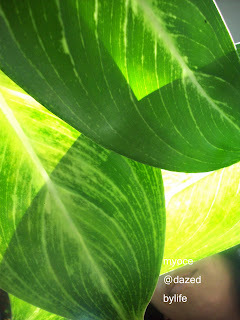 Photo : something left over from imitating a bug yesterday, plant : Aglaonema citiphorn.